The Chandra image of the elliptical galaxy NGC 4261 reveals dozens of black holes and neutron stars strung out across tens of thousands of light years like beads on a necklace. The spectacular structure, which is not apparent from the optical image of the galaxy, is thought to be the remains of a collision between galaxies a few billion years ago, when a smaller galaxy was captured and pulled apart by the gravitational tidal forces of NGC 4261. As the doomed galaxy fell into the larger galaxy, large streams of gas were pulled out into long tidal tails. Shock waves in these tidal tails triggered the formation of many massive stars. However as the image above shows, the optical evidence rather quickly fades into the starry background of the galaxy, whereas the X-ray signature lingers for hundreds of millions of years. 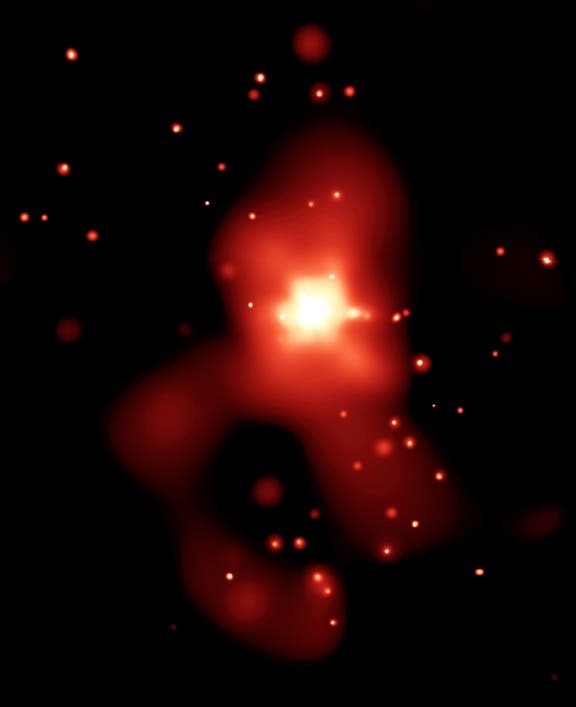 Chandra's image of NGC 4261 shows that X-ray observations may be the best way to identify the ancient remains of mergers between galaxies. The Hubble Space Telescope picture below of the center of NGC 4261 tells a dramatic tale. The gas and dust in this disk are swirling into what is almost certainly a super, perhaps super-super massive black hole. 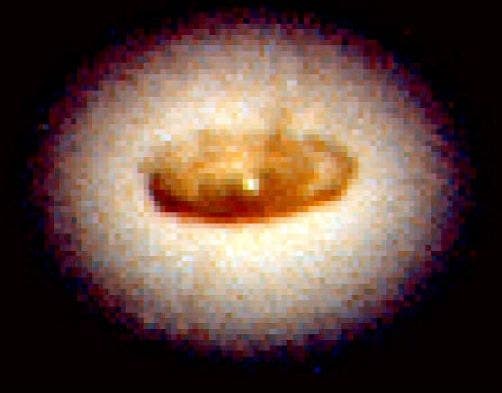 The disk is probably what remains of the smaller galaxy that fell in hundreds of millions of years ago. Collisions like this may be a common way of creating such active galactic nuclei as quasars. Strangely, the center of this fiery whirlpool is offset from the exact center of the galaxy – for a reason that for now remains an astronomical mystery.